NASA’s Cassini spacecraft has captured the first close-up view of Daphnis, one of at least 62 moons found orbiting Saturn, plowing a path through the planet’s icy rings and raising waves in its wake. The image taken by Cassini’s narrow-angle camera Jan. 16 is the best view ever taken of Daphnis, a football-shaped object carving a gap in one of Saturn’s outer rings. The spacecraft was about 17,000 miles (28,000 kilometres) from Daphnis at the time. 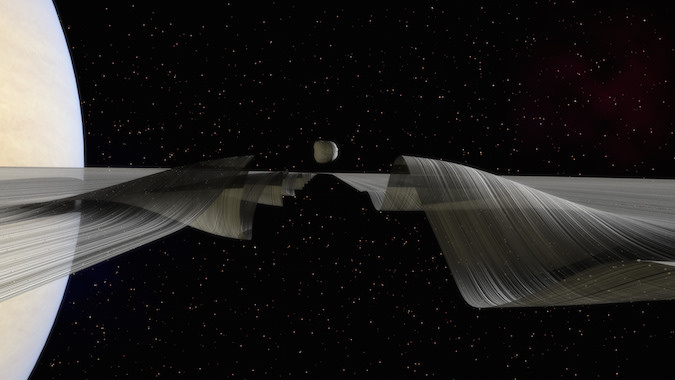 The moon was discovered by Cassini scientists in 2005, confirming suspicions that something was hiding inside the Keeler Gap, one of several open lanes in Saturn’s discontinuous ring system. The moon measures around 5 miles (8 kilometres) in diameter, and the Keeler Gap stretches around 26 miles (42 kilometres) wide, a relatively narrow opening in which Daphnis’s weak gravity brushes up against the ice particles making up the walls of the gap. Material at the inner edge of the gap orbit Saturn at slightly faster speeds than Daphnis, fostering waves that appear ahead of the moon’s path. The waves trail Daphnis at the outer margins of the Keeler Gap, where ice particles move slower relative to Saturn. 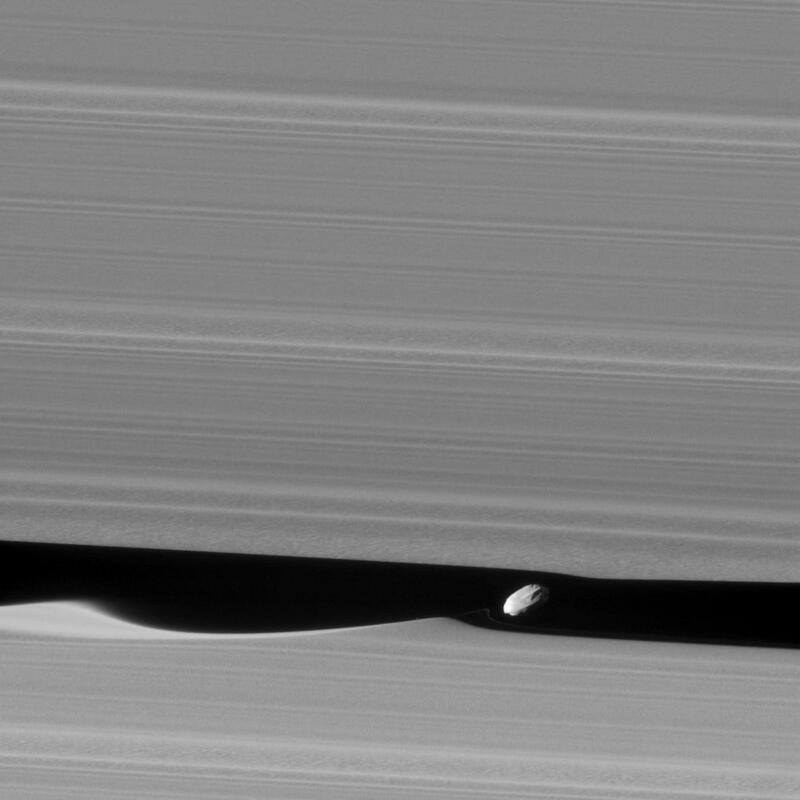 Daphnis orbits with a slight inclination, making the moon oscillate above and below the ring plane and dragging icy material along with it. A longer-range picture taken by Cassini in 2009 shows Daphnis casting an elongated shadow across Saturn’s rings, along with the vertical extent of the waves created by the moon’s passage. The June 2009 observation was aided by Saturn’s equinox, when the sun shines in line with the planet’s ring plane. Saturn has an equinox once every half-year on the planet, equivalent to approximately 15 Earth years. After its discovery in 2005, Daphnis was named for a pastoral poet, shepherd and pipes player in Greek mythology, according to NASA. Daphnis was the son of Hermes, brother of Pan and a descendant of the Titans, tying the name to other members of the Saturn system. Scientists are already analysing the new image of Daphnis and identifying broad surface features on the moon. 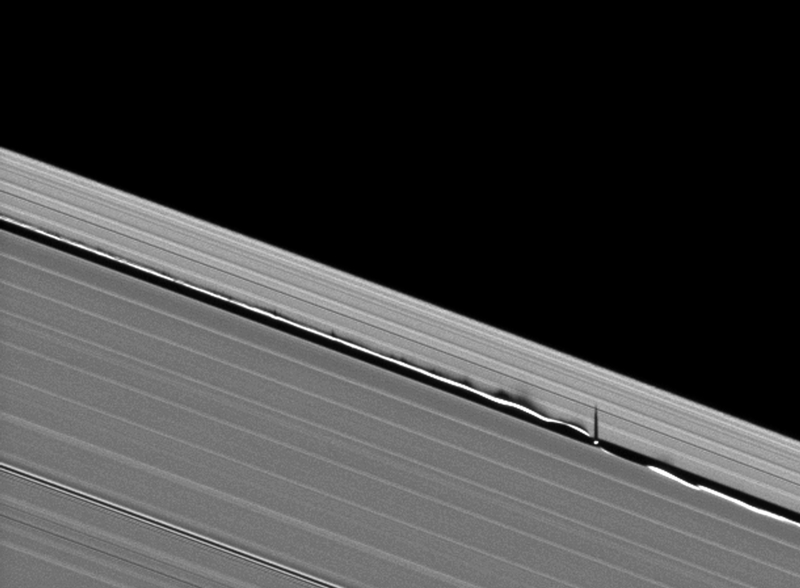 Scientists say the grainy appearance observed in several segments of the A ring adjacent to the gap occupied by Daphnis could mark regions where ice particles are clumping together. Cassini is in the final year of its mission, after swinging into a “ring-grazing” orbit Nov. 30 that takes the probe just outside Saturn’s outer F ring, around 57,000 miles (91,000 kilometres) from the planet’s cloud tops. The spacecraft, on station around Saturn since 2004, will stay in the ring-grazing orbit three more months, completing 20 laps around the planet before the mission’s final flyby of the large haze-enshrouded moon Titan on April 22 nudges Cassini on a trajectory between Saturn’s cloud tops and its innermost ring. Running low on fuel, Cassini will make 22 trips through the 1,500-mile (2,400-kilometre) ring gap just above Saturn from April 26 until Sept. 15, when the spacecraft will make a final destructive plunge into the planet, transmitting data on its atmosphere until the signal is lost.